MSABC: are you ready for Think Pink week? 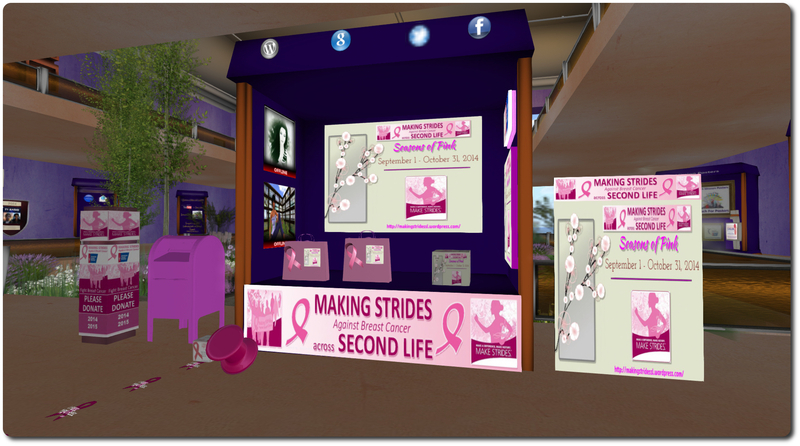 Making Strides Against Breast Cancer (MSABC) in SL is underway, and run through until the end of October. With activates taking place across the grid, and kiosks available in stores ,clubs and venues to allow people to donate to the cause, and the I Feel, You Feel hunt underway, The MSABC in SL committee want to get people in a pink mood through the first week of October, with Think Pink Week. The week will be marked with events taking place each day from Wednesday October 1st through until Wednesday October 8th inclusive, and everyone is invited to participate. Thursday, October 2nd, 2014: Pink Shoe Day – help stomp out cancer by wearing pink shoes, boots, flip-flops, or pink feet! Tuesday, October 7th, 2014: Pink Swag Day – put on your best pink attire and show off your pink swag throughout the day. Go entirely pink and enter the Pink Swag Day photo contest! Wednesday, October 8th, 2014: Pink Honor & Remembrance Day – as Think Pink Week ends, it is time to honour and remember those who have lost their fight against breast cancer. Honour a loved one by place the special pink ribbon at your Second Life home or business. Enter a special dedication to a loved one to be displayed on the MSABC in SL website. 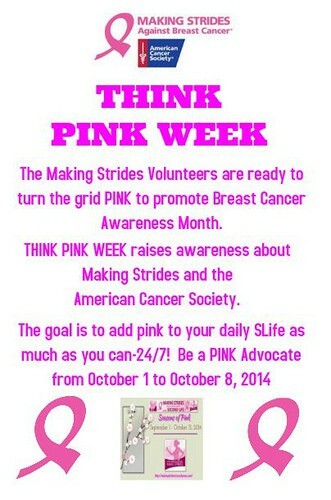 Why Not Run Your Own Think Pink Event? Clubs, shops, groups and venues across SL are invited to run their own Think Pink Week event. It doesn’t have to run for the whole week or even a whole day – as long as it meets the aims of MSABC in SL in raising awareness about breast cancers (and helps raise funds for the American Cancer Society!). Simply pick-up a fundraising toolkit from the MSABC kiosk, make sure your event meets the MSABC in SL fundraising guidelines and then pass on details of the event to the MSABC team through the events submissions page on the website. They’ll then promote it through the official MSABC social media sites and on the Strides Fundraising Event Boards in Second Life.